DECEMBER 2007 -- We hope you all enjoyed the Regionals this year and that you’ll be working on some of the projects during the winter. We had some very nice needlework and craft entries last year for “Let’s Celebrate” day and are looking forward to an even bigger and better display next July. In the October issue of the Granger when we listed the winners of the contests the name of Gunnar Schuster of Litchfield, the 1st Place winner in the Youth Class of the Craft contest was inadvertently omitted and we do apologize. Congratulations Gunnar! We were absolutely overwhelmed by the response to our request for Christmas stockings for Foster Children. There were about 600 stockings and many boxes and bags full of items to fill them. Thanks to all of you who participated in this project. This year for Foster Families we are going to reprise some of the most popular projects that we have done in other years - Comfy Covers, Memory Books, Gift Cards from Wal-Mart, Target, McDonald’s, etc. or Christmas Stockings. For Covenant to Care this year we have been asked to make up Thanksgiving Food Bags. There is a list of specific foods to be included so that all the bags will be alike. Plus a $10 gift certificate to a chain grocery store to purchase the turkey or other meat. Your CWA Chairman can give you the details. The bags are to be brought to State Session in October where they will be picked up by the representative from Covenant to Care. Our State Projects for monetary donations along with CT Granger Trust Fund and Student Loan Fund will be the Camp Berger Maintenance Fund. This is a fund that was set up a few years ago but was not publicized very much and now that the camp is 50 years old there are things that need to be replaced so extra money is needed. 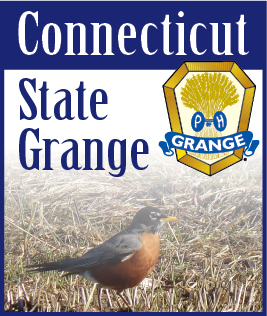 As you will notice, all of our donations this year are Grange funds. I’m sure you’ll all come through for these good causes as you always do. The sales room in the Grange Building at the Big E did very well this year outdoing the nice profit of last year and they’re hoping to do as well or even better next September but they can’t do it without you. Handmade items are needed to fill the tables so if you have some extra time this winter to make a few items they would be most welcome. Best of everything for the coming year to all of you.